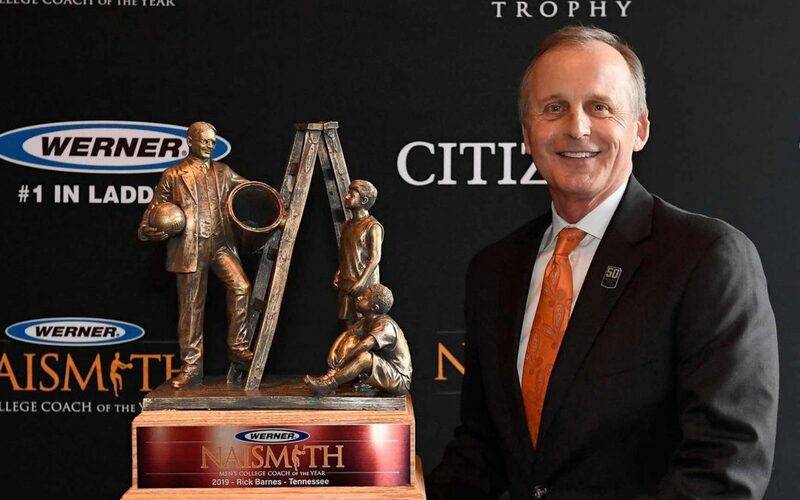 ATLANTA (April 7, 2019) – The Atlanta Tipoff Club named Rick Barnes the winner of the 2019 Werner Ladder Naismith Men’s College Coach of the Year today during the Naismith Awards Brunch presented by Mortenson. Barnes becomes the first Tennessee men’s coach to win the award, adding to the five honors held by former Lady Vols head coach, the late Pat Summitt. Barnes won the top honor edging out the other three finalists Chris Beard (Texas Tech), Tony Bennett (Virginia) and Kelvin Sampson (Houston). He becomes the fifth coach from the Southeastern Conference (SEC) to win the Werner Ladder Naismith Men’s Coach of the Year Award. For the first time in program history, he led the Vols on a 19-game win streak and also directed his team into the top 10 of the Associated Press (AP) Top 25 for the entire regular season, including four weeks where Tennessee was ranked No. 1. In doing so, he became one of six coaches ever to lead multiple schools to a No. 1 AP ranking, joining John Calipari, Frank McGuire, Rick Pitino, Eddie Sutton and Roy Williams. Barnes led his team to the No. 2 seed in the South Region of the NCAA Tournament where the Vols made it to the Sweet 16. During the Naismith Awards Brunch at the Final Four in Minneapolis, Barnes was presented with the Werner Ladder Naismith Coach of the Year commemorative trophy designed by nationally acclaimed sculptor Brian Hanlon. The bronze trophy features Dr. James Naismith, inventor of basketball, holding the original peach basket and ball used to play the first game. Barnes was chosen by the Atlanta Tipoff Club’s national voting academy, comprised of leading journalists from around the country, current and former head coaches, former award winners and conference commissioners, all of whom base their selections on outstanding coaching performances during the 2018-19 college basketball season. Additionally, fans contributed to five percent of the total vote. The final tally was tabulated and certified by Aprio, a premier, CPA-led business advisory firm. Founded during the 1956-57 season, the Atlanta Tipoff Club is committed to promoting the game of basketball and recognizing the outstanding accomplishments of those who make the game so exciting. The Atlanta Tipoff Club administers the Naismith Awards, the most prestigious national honors in all of college and high school basketball. Named in honor of Dr. James Naismith, inventor of the game of basketball, the family of Naismith Awards annually recognizes the most outstanding men’s and women’s college and high school basketball players and coaches. Other Naismith Awards are presented to the men’s and women’s college basketball defensive players of the year, as well as lifetime achievement awards to basketball officials and outstanding contributors to the game. UCLA’s Lew Alcindor received the first Citizen Naismith Trophy in 1969, while the late Anne Donovan (Old Dominion) was the inaugural women’s recipient in 1983. Corporate partners of the Naismith Awards include Bona, Citizen Watch Company, Jersey Mike’s and Werner Ladder. Werner, the official ladder of NCAA® March Madness® and the world leader in ladders offers a complete line of climbing products designed for working at heights. The portfolio includes ladders, attic ladders, scaffolding, pump jacks, stages, planks, stepstools, accessories and fall protection equipment including harnesses, lanyards, anchors and compliance kits. From ladders to fall protection, WERNER provides a full line of climbing equipment that’s engineered to give you maximum safety, durability and productivity at every height. All Werner products meet or exceed applicable international safety standards. For more information, visit www.wernerladder.com.